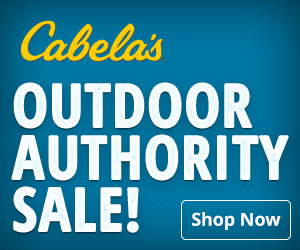 OMM Outfitters Blog: Kentucky Chocolate! We sat above the “Holler” glassing the nooks and crannies of the reclaimed coal mines of Kentucky, when our guide Brandon whispered excitedly, “there he is, there’s Chocolate!” As we followed his pointing gesture with our binoculars, we too spotted the 6x6 bull elk grazing below us, 800 yards away. His dark “chocolate” antlers with polished tips were unmistakable from the three other bulls. My son Joe and I had front row seats to the best beguiling festival that Kentucky has to offer. The show lasted for two hours as we witnessed bulls, bugles, and battles for the eight cows below us. As the sun set on a misty Kentucky night, we anxiously headed back to camp, anxious to plan our opening day strategy for the Kentucky rifle season. So opening day strategy continues around the campfire…. 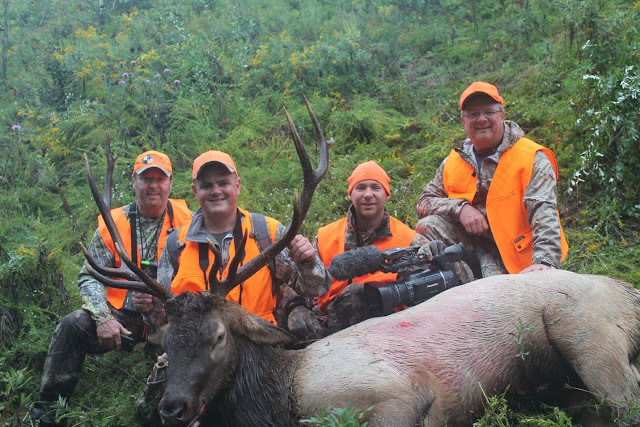 While both Joe and I are experienced hunters, and have been on other guided hunts, this was our first elk hunt. What our experiences tell us is, do your homework months ahead of time in regards to finding the right guide and outfitter. Once done, follow the lead of your guide, and have faith in who you’ve hired. This strategy has served us well over the years. Setting around the campfire, Joe couldn’t stop talking about that “chocolate” elk we saw that evening. So he asked his guide Brandon if we could hunt this particular elk, and Brandon confidently said “absolutely, if that’s what you’d like. 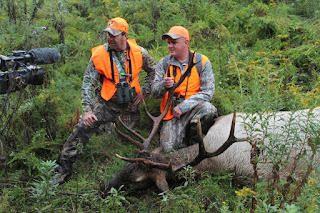 I’ve been scouting him for several weeks, and I’ll do my best to find him and provide you with an opportunity for a shot.” We figured with a five day hunt planned, spending a day or two after one specific elk would be a good choice. So, with our faith in our guide, that was our plan. Brandon and John were our guides, and they knew the land, the elk, and even named one Chocolate! Their passion for the outdoors, the hunt, and our satisfaction, were clearly evident. 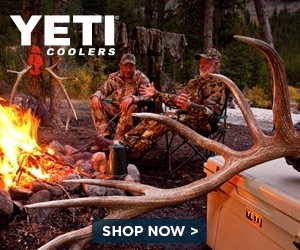 While there are many aspects to the making of a great outdoor experience such as the elk, guides, family, and friends, the catalyst of any hunt is the “camp.” This is where you can relax, relive the day, share stores, and break bread with people that share the same passion for the great outdoors as you. I must say, when Joe and I met our camp hosts, Bernice and Willie, we felt an immediate connection. Over the next few days, that connection quickly grew into a friendship, making camp much more than we expected. The icing on the cake was the food, all of which was cooked over an open fire and Dutch ovens! Last but certainly not least, we had the privilege of sharing camp with Jerry and Jarred from the outdoor TV show “The Bucket List.” I cannot say enough about these guys. Great outdoorsmen, hunters, and conservationists quickly come to mind when I think of them. It was truly an honor to share camp with such fine men. After five long months of anticipation, opening morning arrives! We sat atop of the “Holler” and could hear the bugles an hour before sunrise. There were elk bugling in all directions as far as you could hear. Our guide stood in the pre-dawn darkness tilting his head every few seconds, as he listened to home in on the bulls’ locations. Free ranging wild elk are just that, free ranging and wild, and the elk were gone from where we glassed them the night before. With bugles in the distance, and knowing the pattern of the elk movement, our guide made “the call” to head to the next “Holler.” We moved about a mile to the south in search of elk, and as we glassed across the “Holler” we saw half dozen cows, a small bull, and to our amazement, there stood Chocolate! You can call it a coincidence, you can call it luck, you can call it anything you want, and I’ll call it the value of a great guide. Now it’s all up to Joe! All the planning and the practice on the range are soon to be put to the test. Joe immediately chambers a round, lies on the ground, and prepares for the shot. While everything was unfolding very quickly, I had the advantage….. 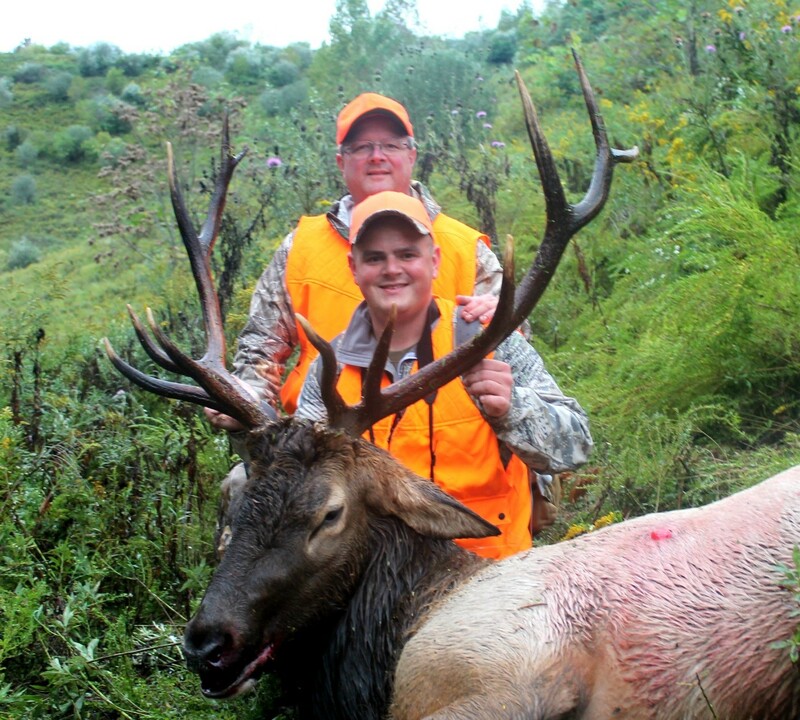 I had the front row seat to my son’s hunt of a lifetime, as he settled the crosshairs on a bull elk. All was quiet, and it seemed like an eternity before the Rugar 06 cracked the morning silence. The bull immediately bucked, and run 30 yards before stopping. He stood there for a few moments, then began to sway, and within a few seconds, the 6x6 chocolate antlered bull went down. For a few seconds, time stood still…. Nobody said anything! Finally I break the silence, “Nice shot Joe!” Joe turns and looks at me with a grin and a nod. I cannot describe the connection Joe and I shared at that moment in time, other than to say, what a feeling…..
Back at camp there were high fives and congratulations from everyone. Joe said, “I can’t believe I shot a 6x6 Kentucky bull elk. 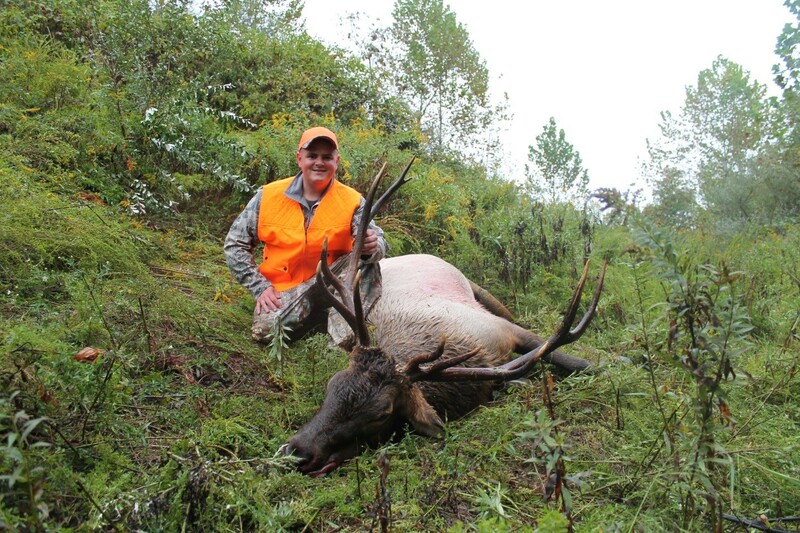 Dad, it doesn’t get any better than this!” I smiled and nodded in agreement, while I thought to myself, “Oh yes it does get better.” A front row seat at the top of the “Holler” while looking over the shoulder of my son as he harvests an elk of a lifetime. Now that’s “better”!